This pic was taken with the Kodak DX6490 without any add-ons on a Full Moon at around 2am in the morning! I have just started my stint on photography and am really a novice. Comments on this pic is welcome. Way cool picture......moody and mysterious. Amazing that the only light was from the moon. Beautiful shot! Where was it taken? Super shot! If this is one of your first shots, you're in pretty good shape here. The 6490 really shines at night, (if you'll pardon the pun). Great shot. looks like you won't have any problems learning. Ilove the mood of this pic. I'll have to try this myself. 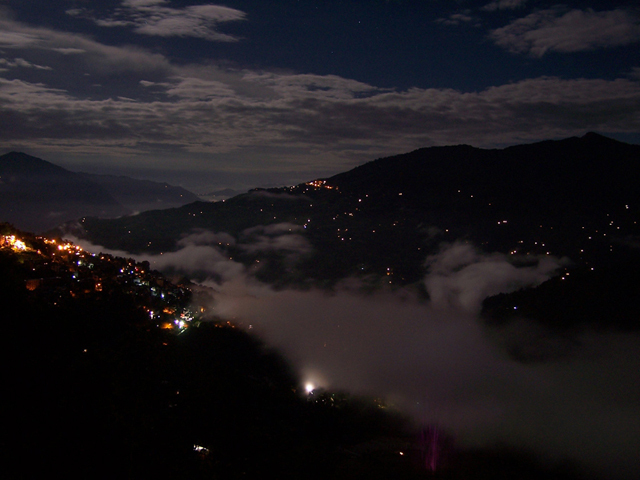 This was taken from my veranda at home here in Gangtok. Its the capital of Sikkim in India. Thanx for the appreciation--- its boosted me to do more. Hope to post more of my pics soon!